The rejection of the Reform Bill in Parliament by the House of Lords provoked widespread unrest throughout the country. The old order was being challenged and the “moth of democracy” was in the air. Nowhere was there more trouble than in Bristol. On October 29th 1831 Sir Charles Wetherell, the senior Alderman of Bristol, called upon the army to put an end to the civil unrest in the city and to this end Lieutenant-Colonel Brereton prepared for action a squadron of the 14th Light Dragoons and a troop of the 3rd Dragoon Guards. The protesting citizens of Bristol became increasingly restless, and attacked Wetherell’s carriage as it made its way to the Guildhall; the Mansion House was attacked, and the Riot Act was read. 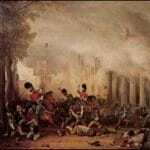 The cavalry finally arrived in the evening and, no doubt recalling the Peterloo Massacre of 1819 and believing that his force was too weak to stop the riot but strong enough to exacerbate it, Brereton at first refused to commit his men. His irresolution was interpreted as weakness by the mob, and matters went from bad to worse. It was into this maelstrom that Captain Codrington with forty men of the Dodington troop of the Gloucestershire Yeomanry Cavalry rode, having been summoned by messenger in the morning. Having told his men ‘that as they had ridden sixteen miles, they had better put up their horses,’ Codrington met up with Brereton. To Codrington’s chagrin, Brereton failed to give him any orders (a charge that was repeated in the court-martial brought against Brereton after the riots), so Codrington turned his troop about and they rode back the way they had come. At midday Captain Estcourt with the Tetbury Troop of the Gloucestershire Yeomanry Cavalry arrived in Bristol and they were sent to the St James Barton district of Bristol, with orders to prevent any more pillaging in that area. In this they were successful, and remained in Bristol for the next week. In addition to the cost of the destruction of property and the loss of life of those killed in the riots, four rioters were hanged, twenty-seven transported for life, seven to shorter periods of transportation, and fifty-four were gaoled. Lt.Colonel Brereton took his own life before his trial was concluded. The Reform Bill became law the following year, and in 1836 Bristol was to form its own police force. Picture: The 3rd Dragoon Guards in the Bristol Riots.